The San Francisco Municipal Transportation Agency is adopting a new advertising policy, hoping to end years of offensive ads read daily by commuters, who have bitterly complained. 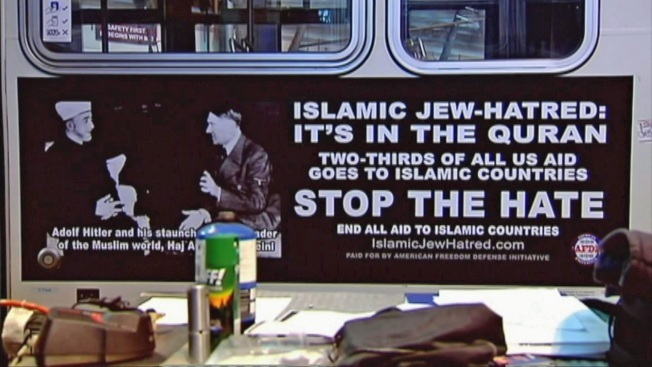 "We certainly understand why they were offended by these ads; they offended us as well," said Paul Rose, chief spokesperson for the SFMTA. "They have been offensive, but there was no way we could not not run them." Major cities across the country have dealt with a similar problem: run the ads or get sued for violation of free speech. SFMTA says it has studied other cities that were able to create advertising criteria. If they are demeaning in nature, racist in nature, or political in nature, they don't run. Many commuters say they think government-run transportation shouldn't have politically sponsored ads. "I think all political and maybe even religious advertising should be eliminated from Muni buses," commuter David Smith, of San Francisco, said. "The problem is while you're going to be banning this offensive, anti-Muslim speech, you're also going to be banning pro-diversity and educational speech as well, and that could be damaging," said Sameena Usman, spokeswoman for the Council on American-Islamic Relations. The new SFMTA policy takes effect Wednesday, and the agency said all ads on its buses currently meet the new criteria.